After a lot of digging, forming and pouring we got a special delivery. This lovely hunk of metal showed up in our driveway. 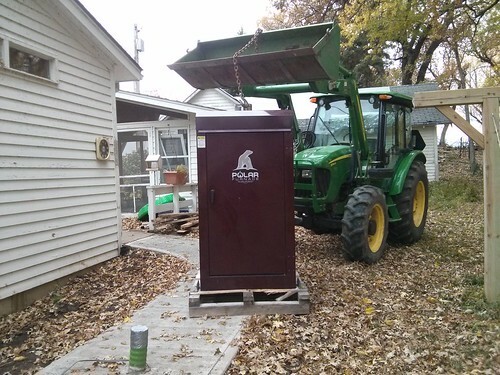 It’s our new outdoor wood furnace, a Polar furnace G2. 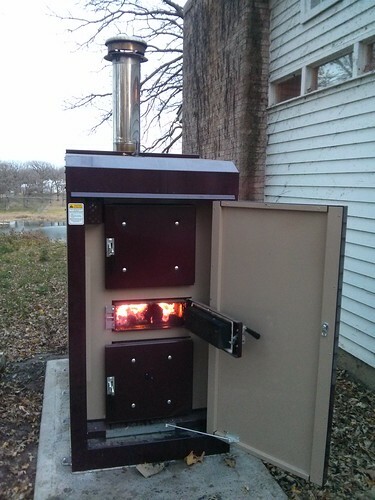 We’ve been heating with wood for two winters now, and our woodstove wasn’t cutting it anymore. The old woodstove heated our house very unevenly. The room where the stove was located could easily reach 100°F while the other side of the house barely hit 65° (and that’s with two big box fans moving air around). The biggest concern was safety. The old woodstove needed to be hooked up to a proper chimney liner in order to meet fire-safety standards. That was going to cost at least $1000 and we’d still have the uneven-heating problems. 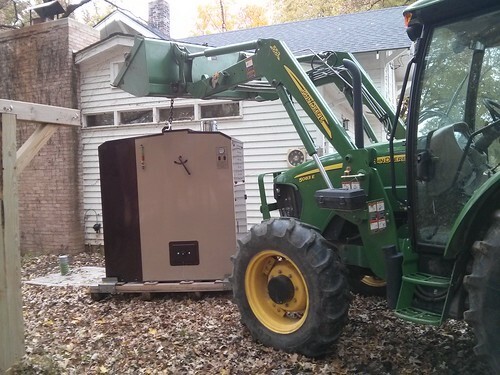 The outdoor wood boiler addresses all of those problems. It moves the fire outside, which greatly reduces the possibility of the inadvertent combustion of our domicile. 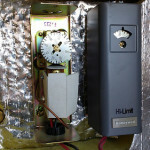 It heats through our normal central-air system, which keeps a nice even heat throughout the entire house. Plus, with the fire outside, the firewood (and it’s accompanying mess) can stay outside too. My wife is very happy with that part (really with all those parts). This is where the newer style gasification wood boilers come in. These new wood boilers barely smoke at all when they’re running. It should all work out quite nicely if we can get the thing installed. 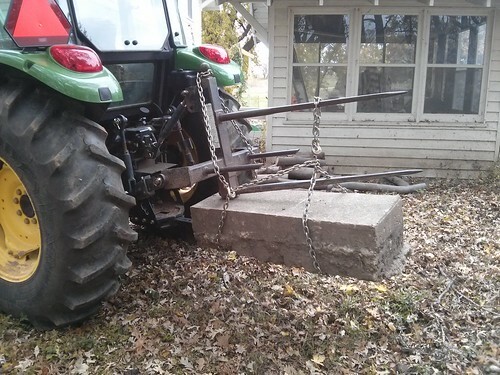 When the time came to move it, we quickly figured out that our tractor is at it’s limit trying to lift the 2300lb. furnace with the front bucket. It can do it, but just barely. When we first tried to pick it up the tractor’s rear wheels were nearly lifted off the ground. Luckily we’re resourceful farmer types and we quickly got this big cement step chained on the back to act as a counterweight. After getting it set in place, there was still a lot of work to do getting the big beast hooked up with plumbing and electricity. 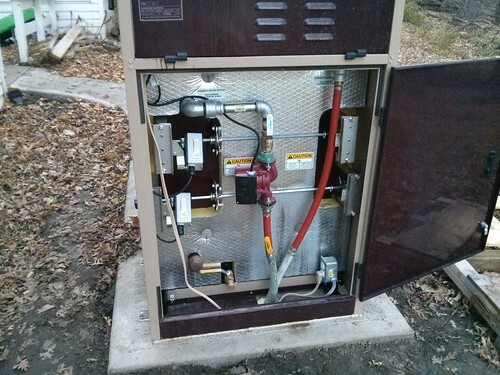 Like most outdoor wood boilers, this one heats up water (to about 200°F) and pumps that hot water into the house. In the house there are heat exchangers on the hot-water heater and the furnace that extract heat from the boiler water and put it to use. It took a few days (and about a bajillion PEX cinch-clamps), but we finally got it all hooked up and working. Then the next day we awoke to find that there were a couple of hiccups that we had to iron out. A gasket had been pinched when installing the water pump, so about half the water was pumped out of the stove and onto the ground. A quick trip to the store saw me back with a new gasket, and it’s been running like a top ever since.